There’s always a best-movie-of-the-summer, and whatever it was supposed to be in 2003, Jack Sparrow (sorry, Captain) came along and sank it. Naturally, with studios and shareholders being what they are, this created a demand for sequels on all sides, and I for one was thrilled at the prospect. I loved Jack’s antics, Will & Elizabeth’s chemistry, Barbossa’s craftiness, and the dogged determination of Commodore Norrington. I’m trying to examine what went right in the first three, and contrast it with what went wrong in the last two, because…well, when something you enjoy becomes unenjoyable, you (I) want to figure out why. As a content creator I need to know things like this, so that I avoid the same pitfalls. So in no particular order, here’s what worked for The Curse of the Black Pearl. Gore Verbinski. As I researched the background of these films, I noticed that Verbinski directed the first three, while others have handled the last two. This is not a coincidence. Verbinski’s vision is not only delightful on its own, but the fact that it’s the consistent form across the trilogy is a boon. That helps bind them tonally and thematically. Jack was not the main character. You could be forgiven for thinking otherwise (I certainly did) because of the marketing, and the fact that he was everyone’s favorite character. But make no mistake, this is a story about Will and Elizabeth, through and through. Jack is just the wild card, the anti-hero, and he has the effect of revealing aspects of the main characters based on his interactions with them. The villain was formidable and respectable. Captain Barbossa was AMAZING in this film, as well as subsequent installments. He was frightening, serious, and capable. A worthy foe for Will, Elizabeth, and Jack, against all of whom he squares off at different times and in different ways. Ultimately it takes all three of them to bring him down. He earns it. The naval foil character also had depth and resonance on an emotional level. Commodore Norrington fills this role primarily in the first film, while Lord Beckett takes over for 2 and 3. “The Spaniard” is this guy in 4, and “Leftenant Faramir” (I swear they never say the character’s actual name, but it’s David Fenham) is the guy in 5, but they’re both so forgettable and one-dimensional as to make them pointless additions to the story. Norrington, though, is romantically linked to Elizabeth, and this fuels his motivation in the story, while simultaneously complicating Elizabeth’s decision process. The dialogue was crisp, sharp, and said so much with so little. 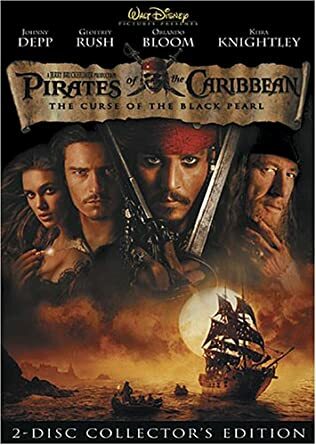 Anyone who has seen Black Pearl can quote no less than 10 lines from it, from any of the characters. Dialogue is hard, and the writers put serious effort into it. This may have dwindled in the sequels, but it dropped straight off in the last two. The pirate cast was not hokey or B-movie reel. While we get to enjoy Gibbs across all five films, and Little Marty comes back for Dead Men, I really missed Pintel and Raghetti after World’s End. I felt like the good, rough pirate extras were replaced by pointless clowns. Even after rewatching Black Pearl last night I didn’t get that impression. The nods to the ride at Disneyland were great Easter eggs. I rode the ride in spring of 2003 and saw the movie a few months later, so the little bits taken from the ride were fresh in my mind. Gibbs sleeping with the pigs, the pirates chasing silhouetted damsels in backlit windows, prisoners trying to lure the dog with the keys, and many more. This movie was, after all, a big gamble after being based on a ride (which hadn’t been done before and has not been successfully done since) and those cues helped the audience feel like they were riding through Port Royal and Tortuga just like they rode through the ride. The moonlight fights! HOLY CRAP everyone was talking about the fight in the cave at the end, between Barbossa and Jack, not only because of the fancy fencing, but because of the effects that challenged the eye and tickled the mind with the moonlight tricks. It must have been hell for the SFX folks to nail that, but they did, and it’s held up. The choice of pirate lore/fantasy monster was excellently done. There are a lot of things to draw on from pirate lore, like sea monsters and buried treasure. I think not only the visual aspect of skeletal pirates, but also the way they were used, was ace work. This was a move that others would try to replicate down the line, with mixed success. That’s my take right now, off the top of my head. Next up I shall re-watch Dead Man’s Chest and break it down in similar fashion. Sound off if I missed anything here.